Anheuser-Busch has been so far tight lipped on what they mega brewery has planned for the Super Bowl 2012. It was of course expected that their ad line-up would be again massive like in past years. AdAge reports today that Anheuser-Busch is running six Super Bowl 2012 Ads. 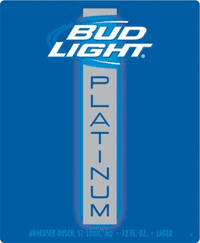 The new Bud Light Platinum will get promoted by the first two Budweiser Super Bowl commercials. Bud Light Platinum is pretty strong with 6% alcohol by volume, more than the typical German Beers. The Bud Light Platinum Super Bowl 2012 Ads are supposed to be not that funny - bummer! Anheuser-Busch is trying a more serious and stylish tone according to Adage. The details of the Budweiser, Bud Light and Bud Light Platinum Super Bowl 2012 Ads. The Bud Light Beer will be featured in two Super Bowl ads. A 60 second spot and 30 second spot are more in line with the usual Bud Light Super Bowl ads. The 30 second ad will have a dog named Weego. The obvious joke goes with the dog responding to the phrase "Here We Go." The second Bud Light Super Bowl 2012 Ad will be enabled by Shazam and feature a famous musician. Apparently you can get a free track. The featured artist has not been revealed yet. The Budweiser Beer be promoted also in two Super Bowl ads. Yes, the Clydesdales are back. The Budweiser Clydesdales are bringing the first beer to a town as Prohibition ended. I still love the Clydesdales Super Bowl Ad from last year. The moment when the bar breaks into singing Tiny Dancer is awesome. The second Budweiser Super Bowl 2012 Ad is a trip through history and Budweiser Beer comes along. We hope to see the first Budweiser and Bud Light Super Bowl Ads teased or released soon.